The project 3D-LightTrans is approaching the finish line. Most of the components and technologies required for the 3D-LightTrans manufacturing chain have been delivered and successfully tested. The modified equipment for industrial manufacturing of hybrid yarn is already available, as well as the machines for two alternative 3D weaving technologies. Special tools and processes have been developed to pre-fixate, drape and fixate the fabrics, and the adaption of the thermoforming process is well on track. For the manufacturing of hybrid yarn, the air mingling technique was selected due to its good impregnation behavior. The process has been optimized to maximize the repeatability and productivity with different glass/polymer mixture ratio in a variety of matrix materials (PP, PA and PET), while guaranteeing highest quality in terms of homogeneity and mechanical performance. The two modified weaving machines delivered by the project enable 3D weaving with structural variety, high quality and the increased speed customary for industrial use. 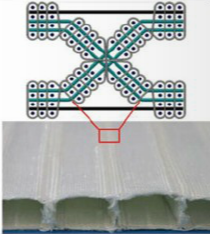 Multilayer fabrics have been produced with Z-reinforcement in different orientations, which improves the delamination behaviour and the out-of-plane properties, especially in 3D stress and impact loading. 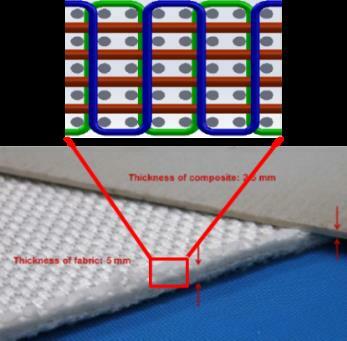 On the other hand, spacer fabrics are now produced in a single step with outer layers connected by crosslink fabrics, which leads to superior mechanical properties of the fabric. Pre-fixation: Hereby, a local increase of mechanical stiffness is achieved in well-defined areas previous to the draping. 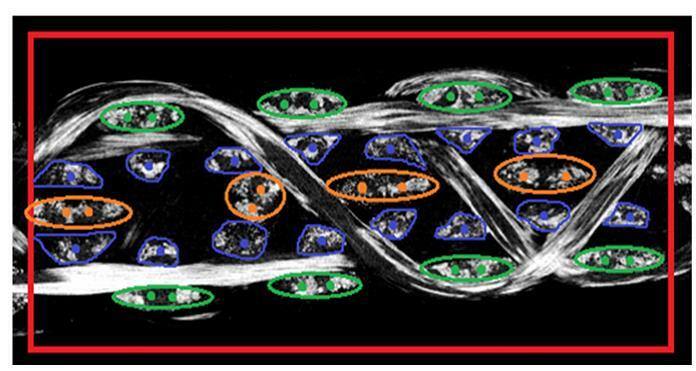 In a novel approach, special fibers with modified characteristics are integrated and processed using alternative heating methods. 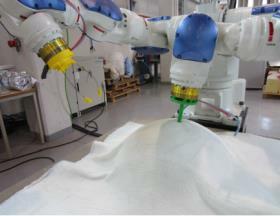 Automated draped (either in a dummy tool or in the thermoforming tool): A special draping device is attached as end-effector to a robot, which is subsequently programed to follow a given trajectory, while the fabric is kept in place by clamping/holding devices. Alternative strategies are evaluated through drapability simulation, and the draping process is supported by force control. Fixation : Thermal activation and/or additional binders are applied to fixate the dry draped fabric in its final 3D geometry fabric. The increased stiffnes allows to storage and transport the draped fabrics without deforming them. Final consolidation: By thermoforming, the thermoplastic melts and flows among the glass fibers, while the press creates a strong compaction of the fabric (above 50%). The manufacturing of the 3D-LightTrans demonstrators (CRF’s top-hinged tailgate and Bentley’s spare wheel well) is also well on track. To ensure the real deployment of the 3D-LightTrans technology, relevant aspects such as an impact study, business cases , product life cycle, and scale-up for mass production are also addressed. The research leading to these results has received funding from the European Union Seventh Framework Programme (FP7/2007-2013) under grant agreement n° 263223.